The choice between an electric and gas-powered water heater depends on a number of factors including local utilities and your own personal preference. Electric water heaters use heating elements to keep the stored water hot and are favored by people looking for low upfront costs and one less item on their utility bill to pay each month. For small homes with smaller water needs, an electric tank can be the perfect option to have the heat you need at an affordable cost. The Rheem Performance 40 Gal electric water heater has enough capacity for an average size family of three or four during daily water usage. Using a 240-volt electrical connection, the tank is capable of delivering up to 54 gallons of hot water during the first hour of use. The dual 4500-watt heating elements act quickly, making sure you have plenty of hot water whenever you need or want. Electric tankless water heaters are the preferred choice of those who want a relatively maintenance-free and easy-to-install heater. Electrically-powered heating elements rapidly heat up water as it enters into the system, eliminating the need for a large tank and increasing the water’s temperature more quickly than similar storage options. For smaller families or spaces, an electric tankless heater is a good choice for saving money and space. The EcoSmart ECO 11 Tankless water heater works quickly while giving you a fine degree of control over the temperature of the water. The self-modulating technology by EcoSmart controls the energy output of the tankless heater, making sure it produces the optimal results each and every time. Since it is tankless, the effects of its heating elements are easy to notice more quickly than a standard tank. Gas is a popular alternative to electric water heaters with tanks because of the cheaper prices they often offer. Depending on your location and the local utility providers, you may find gas will save you several hundreds of dollars a year while still providing more than enough heat for your home’s water needs. This makes gas a frequent choice for larger homes or families that need the most from their hot water heater. 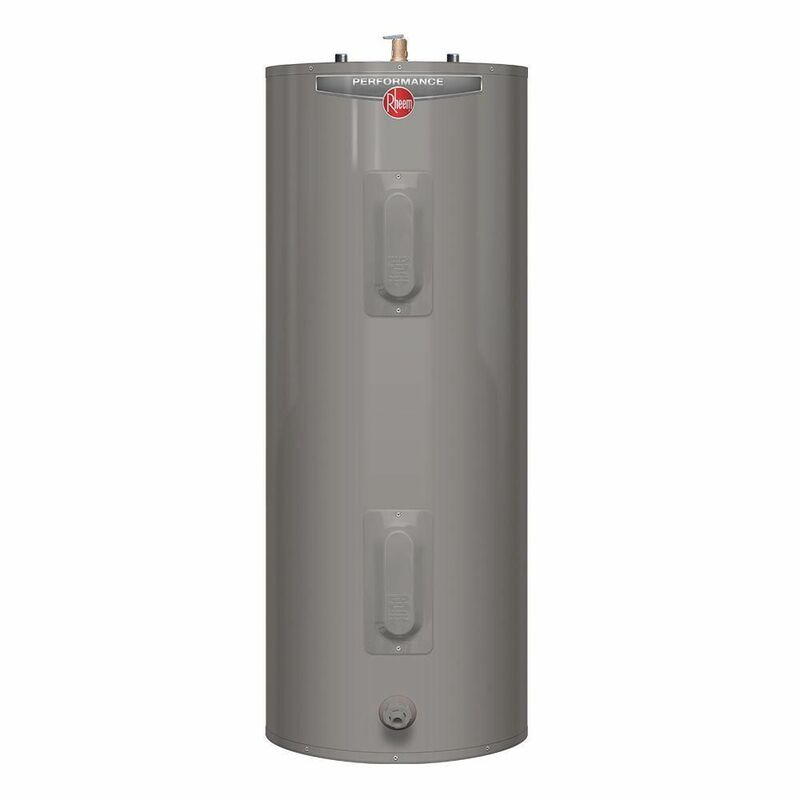 The Rheem Natural Gas 40 gallon water heater uses a large tank that is big enough for two to four people for daily water needs. 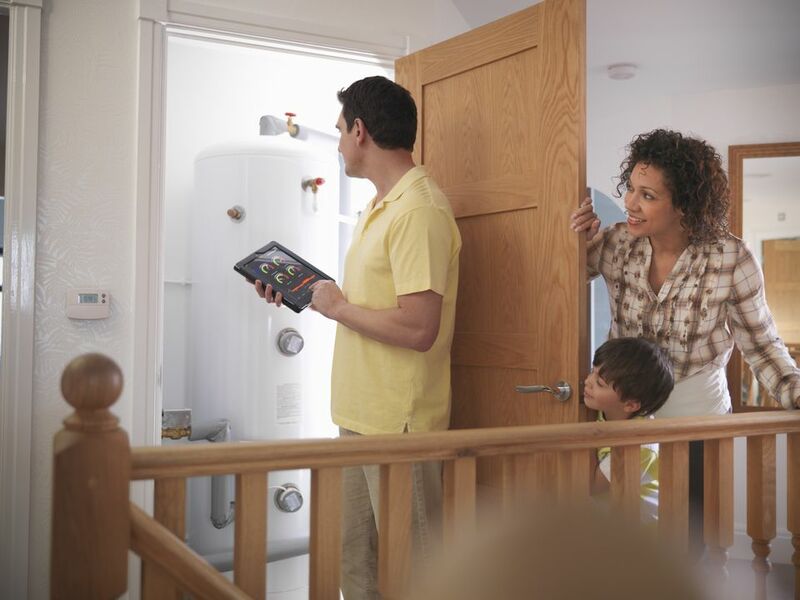 Using natural gas, the water heater features several advanced features to make installation and use simple. The push button ignition system makes the startup process quick and easy. Best of all, the six-year limited warranty will keep your water heater covered even when issues develop. A tankless, gas-powered water heater is a good way to have some of the best of both gas/electric and tank/tankless worlds. Offering the quick heating capabilities of all tankless options with the common lower costs of gas versus electricity, a tankless gas heater is easy to install in small spaces. Better still, since water rapidly heats as it enters the system from the gas-fed heat source, the system is similar to all gas heaters, making maintenance easier. The Rheem Performance Platinum gas tankless heater offers continuous hot water straight from the pipes without the need for large tanks and storage. Using gas makes the tankless heater more energy efficient as well, saving up to $1,100 a year and 1,100 gallons of water a year at the same time. The small design allows it to fit in many small and tight spaces that normal tank heaters would not fit. One thing many people complain about most electric water heaters, regardless if they are tank or tankless, is the limited capacity to satisfy whole-home water needs. Whether you go electric or gas, since tankless heaters cannot heat up enough water for everyone to use at once, large families and homes require a storage tank to provide the water supply required for these greater demands. The largest homes with five or more people require a larger-than-average water heater. Tankless options fail to provide the necessary water supply unless you use several around the home in different areas. A large gas-powered water heater, on the other hand, can satisfy larger water demands from a single location. This can make your water heating setup more energy efficient and cost effective at the same time. The Westinghouse 60 Gallon water heater is one of the largest tanks available on the market today. Made of stainless steel with multiple vents and advanced electronic controls, the tank is designed to be energy efficient and highly controllable in terms of water temperature. Two-inch thick foam around the tank keeps heat in and the surrounding area cool enough to store it near other items and equipment. Those looking to bring some hot water with them on the road will need to look at water heaters that shrink everything down in size. While tankless options are common for road warriors, a mini-tank water heater is the better choice if you plan on needing hot water for bathing, cooking, and outdoor activities. Since all RVs come in different sizes, it is also helpful to find a water heater that gives you different options to choose from. Coming in several different sizes ranging from 2.5 to 7 gallons, the Bosch Tronic 3000 is designed to be a multi-use water heater capable of being installed in many tight spaces. Mountable on a shelf, wall, or floor, this makes it perfect for RV use when you want something small but functional to keep your water warm during cold nights. The electric heater uses 1,440 watts of power and should be installed professionally for the best results. The primary limitation of most tankless water heaters is capacity. Instantly heating water up as it enters the system is good for single-use tasks like cooking or bathing, but the moment more than one person needs hot water, the tankless heater will fail. One popular way to overcome this challenge is with a point of use water heaters. Connecting straight up to a shower, sink, or other local water supply, these water heaters only heat up the water you need in that spot. When you want a small but effective point of use water heater, the InSinkErator HWT-F1000S is hard to beat thanks to its combined heating and filtration systems. Designed to be used nearly anywhere there is a typical faucet hookup, the water heater electrically heats water to the desired temperature regardless if you use it in the kitchen, bathroom, or elsewhere. More and more people are spending time outdoors, even in the fall and winter when temperatures start to plunge. Having hot water can be important whether you are outside in your backyard or out in the wild camping. Portable water heaters can offer this instant heat with small, portable tankless designs you can connect to a hose or water tap for bathing or cooking. Taking the hot water outdoors can be somewhat tricky unless you have something like the Camplux 5L Outdoor Tankless heater. This small low-pressure heater relies on the same heating principles as normal tankless options, rapidly heating water up as it passes along. The heater connects to standard water supplies, mounts to walls and other flat surfaces, and can heat up to 1.32 gallons of water per minute.